Caring for a slate floor is not a complicated matter. Diligent and regular maintenance will ensure your floor looks as good as new and last for years and years. Your slate floor needs to be cleaned and protected on a regular basis – here are our top tips for great slate floors. Of all the procedures used to maintain a slate floor, dust mopping is probably the most important. Dust, dirt and grit are what cause most surfaces to scratch and mar. Floors that are dust-mopped often stay cleaner and shinier longer. Ideally, you should dust mop your floor daily and more often in heavy traffic areas. Wash your dust mop in cold water with detergent and ensure it is fully dry before dusting your floor. Place mats at entrances to the floor (on both the inside and outside). This will reduce the amount of grit and dirt getting onto your floor. Clean your mats on a daily basis and never leave a mat down on a wet surface. 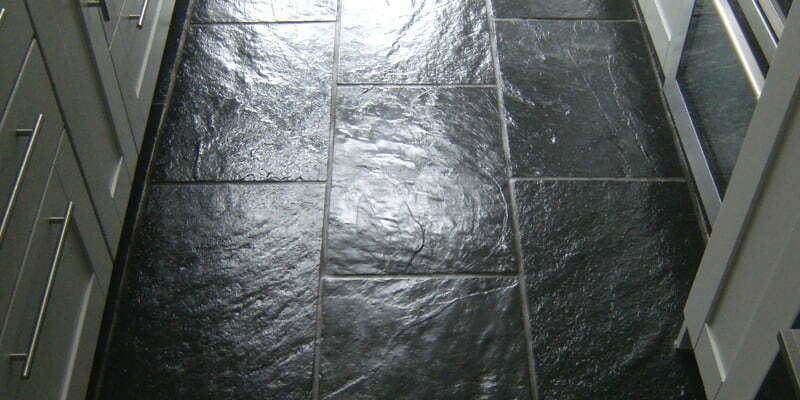 All slate floors also need to be cleaned with a damp or wet mop on a regular basis. How often this is required will depend on the amount of traffic and the finish (honed, coated, textured). For the residential slate floor we recommend mopping at least once a week. To further lengthen the life of your floor, we recommend sealing it every one to three years. This again depends on traffic and whether you have been following a diligent maintenance regime! Today’s technology has delivered hundreds of different types of floor coating, natural and synthetic waxes, acrylics, thermoplastics, polyurethanes, epoxies, etc. To choose the proper chemical for removing them, you must know what type of coating you are dealing with. If you already know what coating is on the floor, contact the product’s manufacturer for removal instructions. If you have no idea what is on the floor, perform the following test. Mix one cup of household ammonia in 1 gallon of warm water. Pour a small amount of this mixture on the floor and agitate with a soft scrub brush. Pick up the solution with a wet vacuum or a dry rag. – if you have removed the coating, you will need to use a commercial wax stripper to remove the remaining wax. These coatings are water-based and are easily removed with commercial strippers. Ask for an alkaline acrylic finish stripper. – if you have NOT removed the coating, there is a good possibility that the finish is urethane-based or epoxy-based. What this means is that some very strong solvents will be needed to remove the finish. 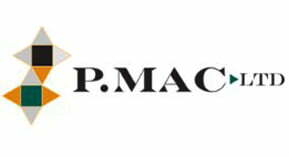 At this point, it might be wise to call in a professional like P Mac. 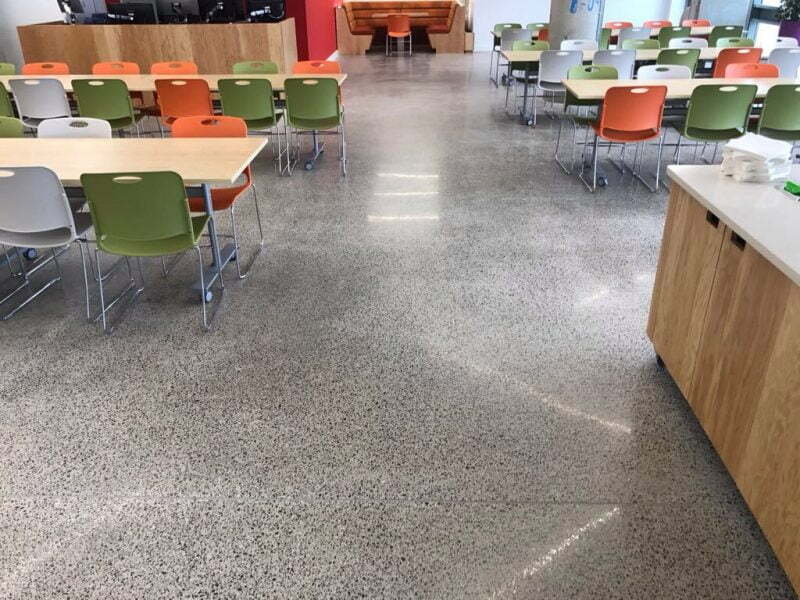 It is common to find urethane-based coating on slate flooring and theses are tricky to remove. Once the floor is completely dry, we advise re-sealing with either a topical or penetrating seal. How to care for your terracotta/quarry tiles Is your asbestos roof leaking?